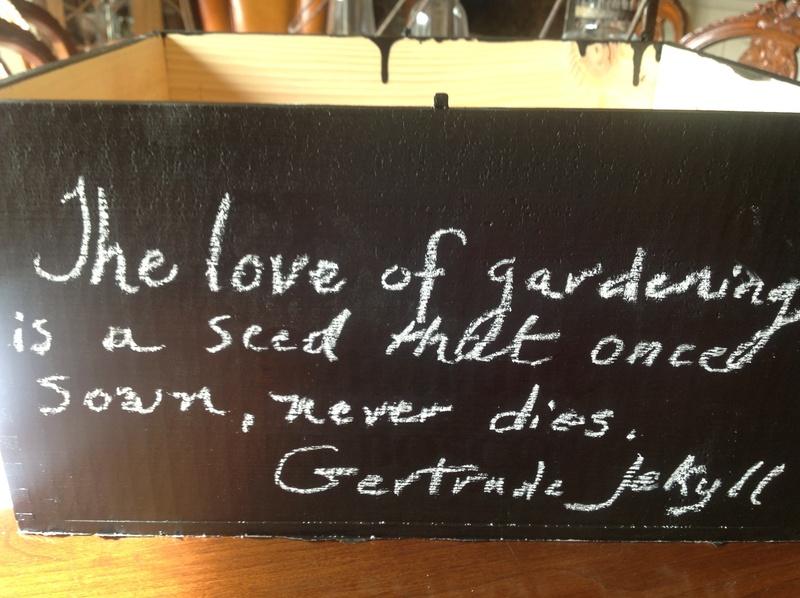 For gardeners, this is a fickle time of year. 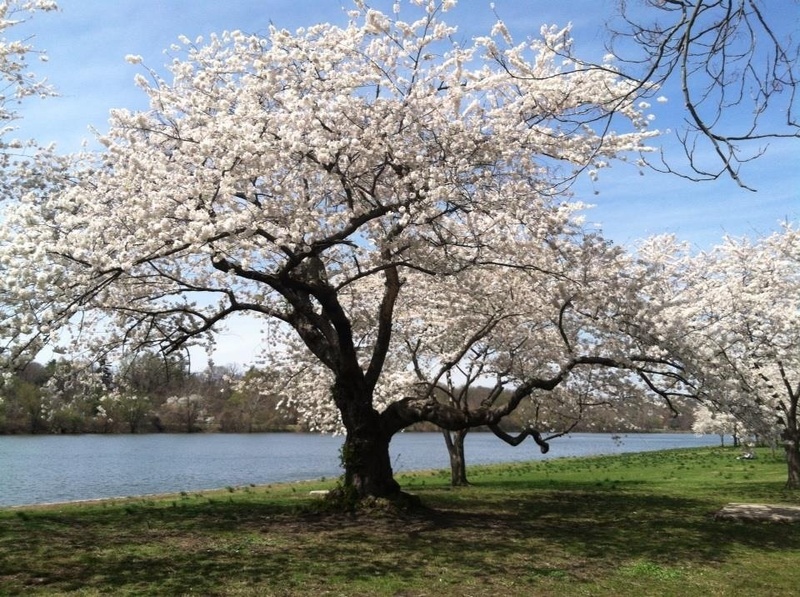 Daytime temperatures on some days soar and flowering trees are bursting into bloom. But night time temperatures are still plummeting and the impatient gardener has to keep the trowel in the shed for a little while longer. In the case of my Northern friends and family, spring is in the distant future and they are desperate to get playing in the dirt! 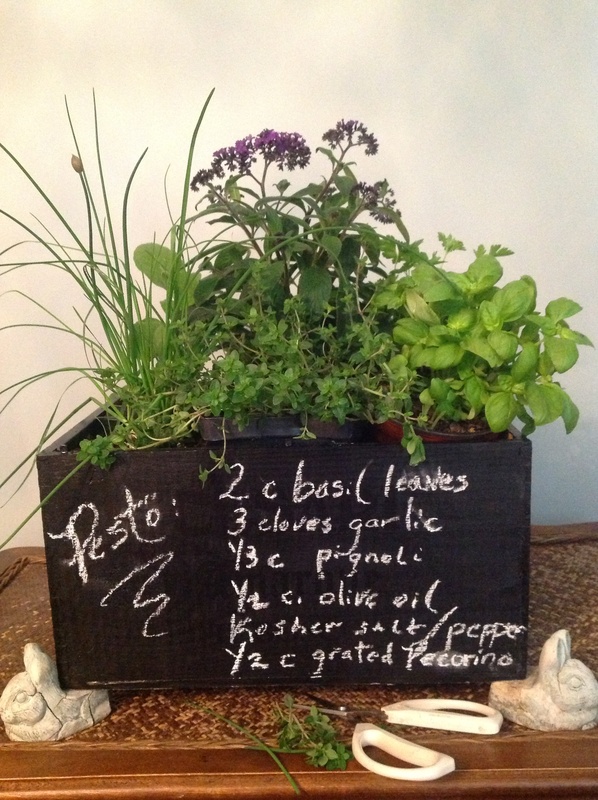 I thought this little project would bring fresh herbs into your kitchen to liven up the spring cooking we all crave while also getting us gardening without the fear of frost killing our plants. 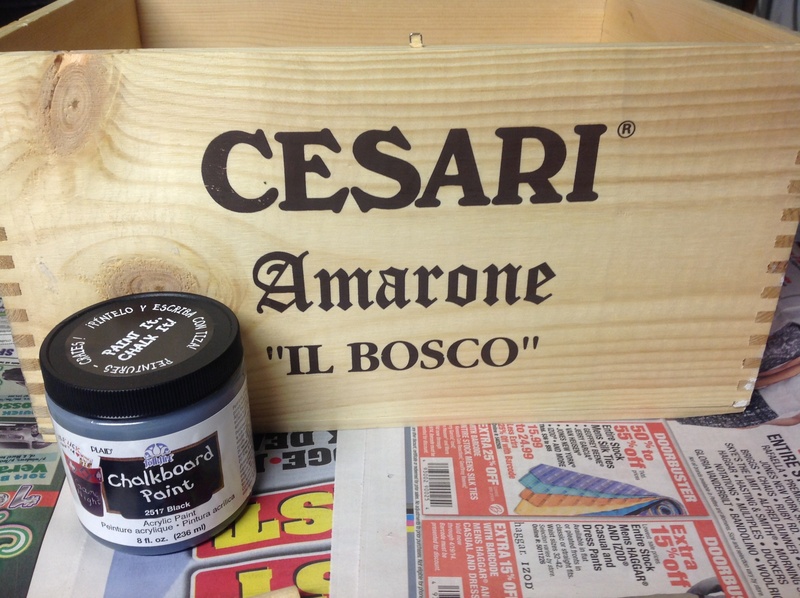 For some time I have been admiring chalkboard paint projects but had not tried my hand at them. 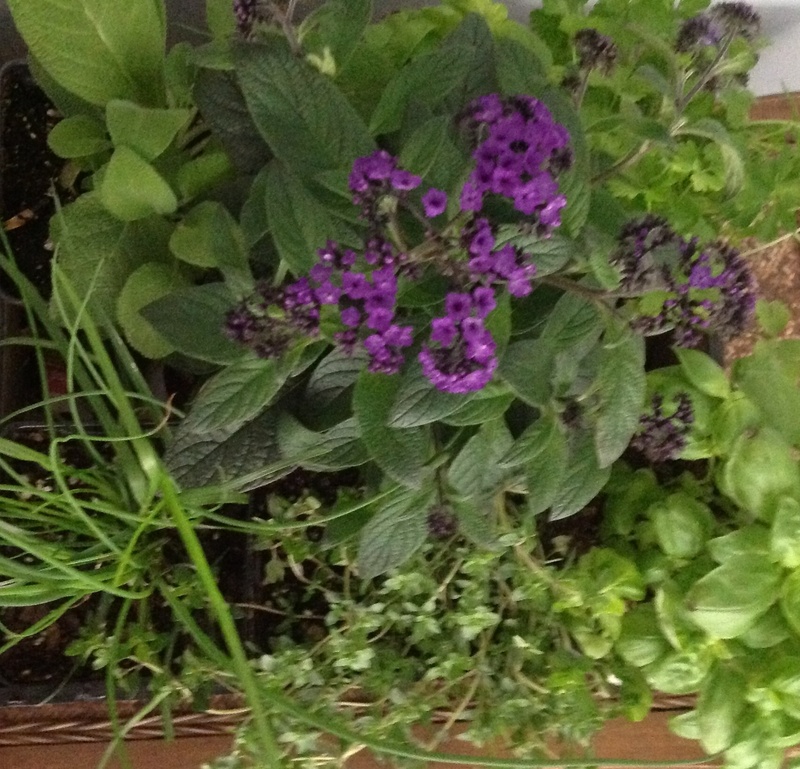 I got the idea that a crate would be perfect for a kitchen herb garden. Of course I thought of wine….crates! Off I went scouring local liquor stores to sweet talk my way to a free wine crate. 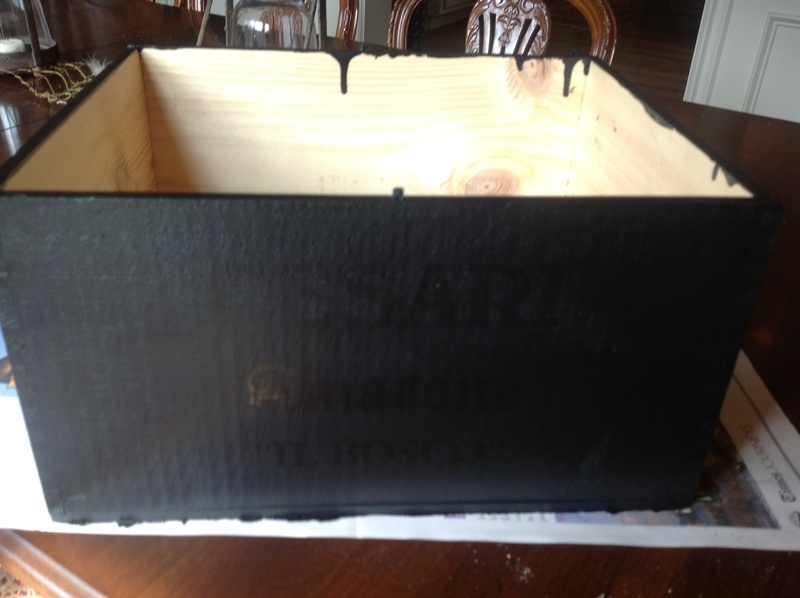 With a small jar of water soluble chalkboard paint( JoAnn’s, $6.99) and a foam brush, I applied several coats of paint to my crate in no time at all and let it cure 24 hrs. 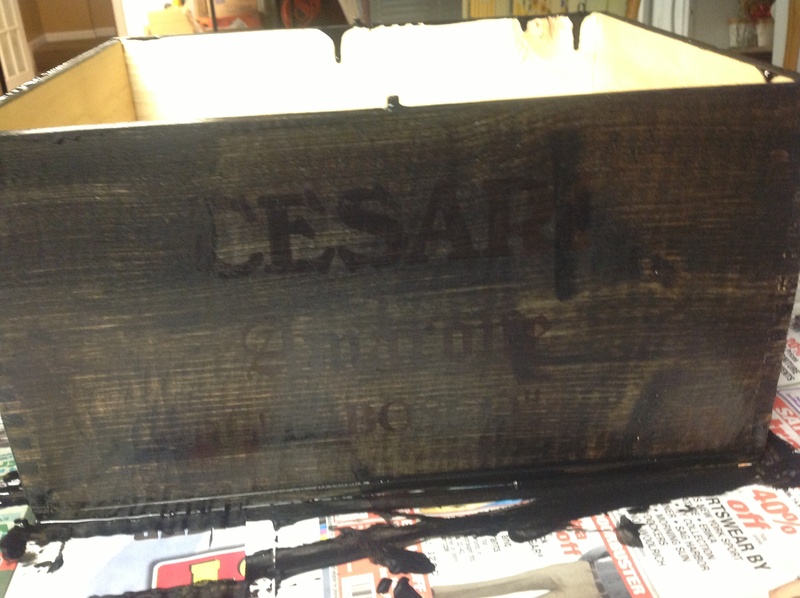 In retrospect, a primer coat would have been a good idea to obliterate the writing on the crate so I could use fewer coats of chalkboard paint. 4 coats later, it’s ready! 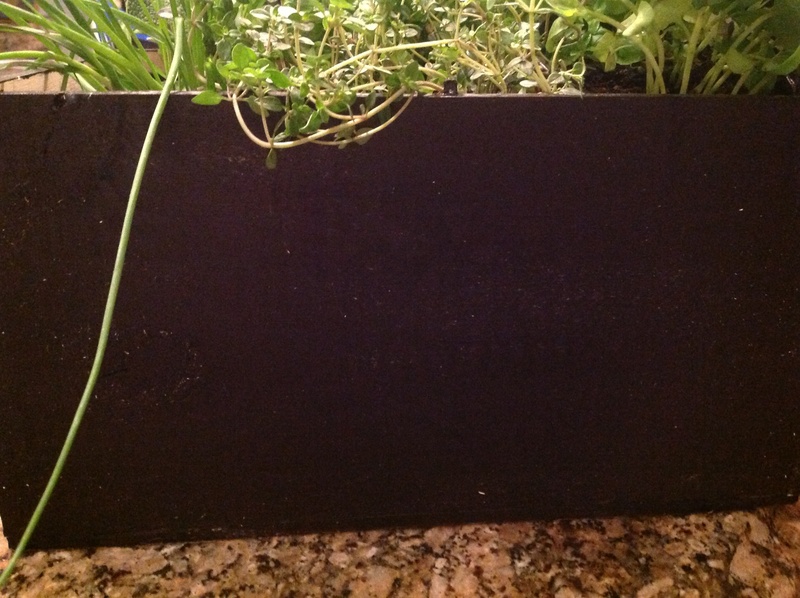 With a blank slate, I dusted off my inner poet and got to the really fun part of writing all over this herb garden crate! What’s so cool is that the chalkboard is erasable with a damp cloth and the slate can be wiped clean for when inspiration strikes again! Use a plain old piece of chalk to write on chalkboard painted surfaces. You can buy specialty chalk pens but they are not necessary and I find them harder to control. I lined the bottom of the crate with plastic and filled it with pots of herbs and a glorious heliotrope, all found at a street farmer’s market this past weekend when Prince Charming and I went to see the Cherry Blossoms in bloom in the city. I love the distinctive scent of the heliotrope which smells like vanilla or a grape popsicle. It rewards the gardener with a continuous show of flowers throughout summer. A favorite garden staple of our grandmothers, it is harder to find today. 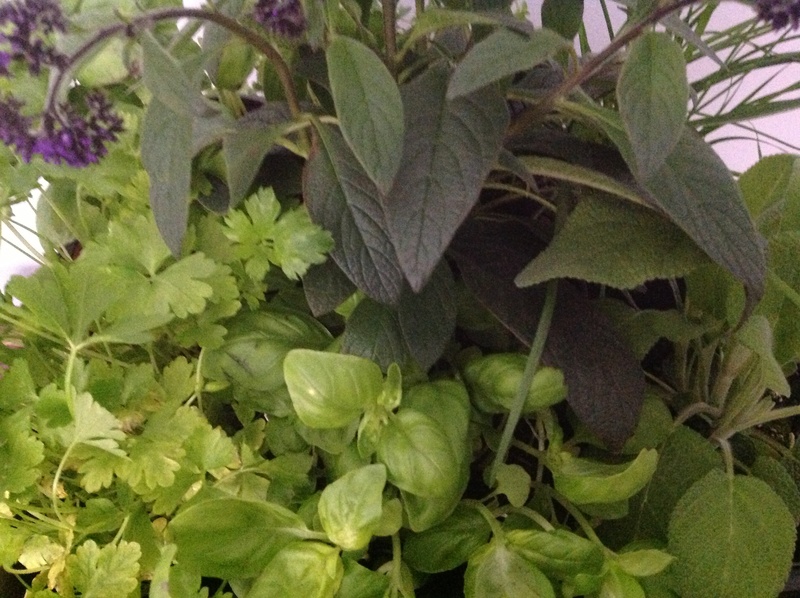 It gave my kitchen herb garden a punch of color and a bit of height. 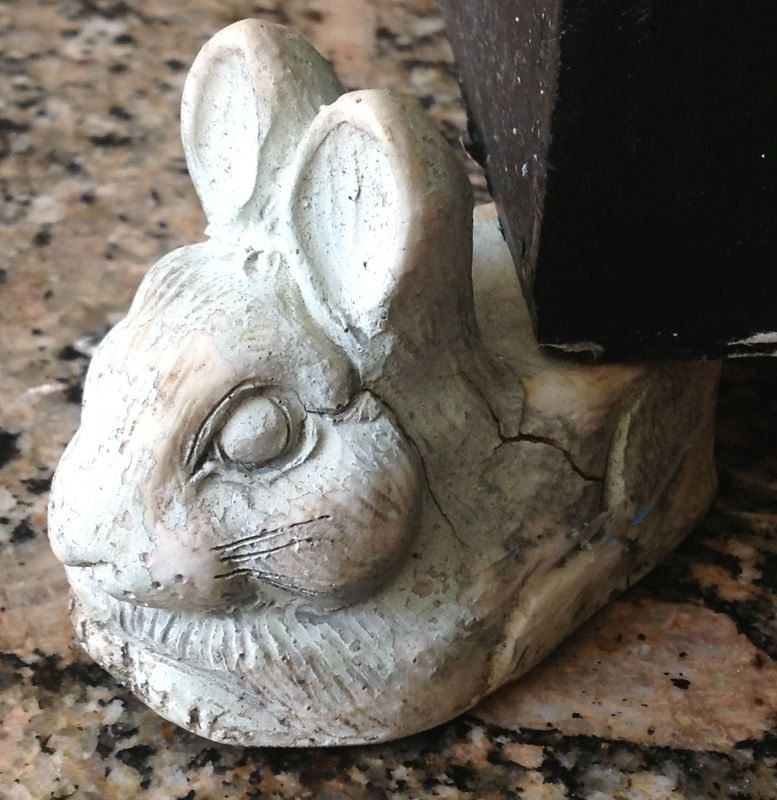 To give the crate a more polished look, I elevated it on adorable bunny planter feet. 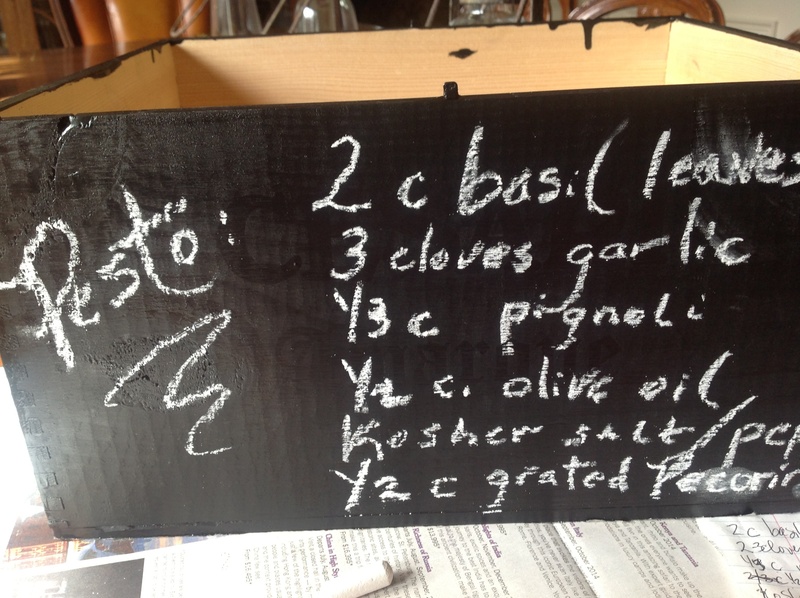 Here is the pesto recipe wiped clean. The paint is truly erasable! 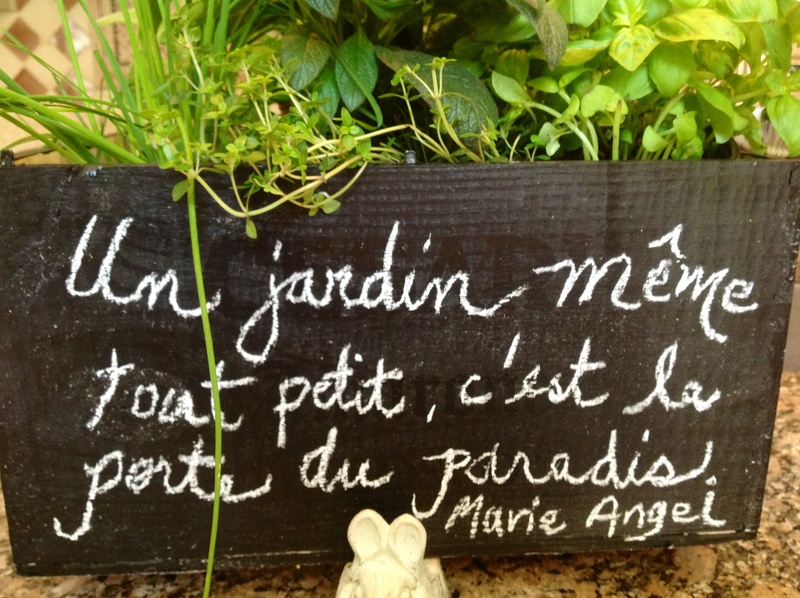 Pesto recipe now becomes a French gardening quote! When spring has finally sprung where you live, the herbs can be planted outdoors. 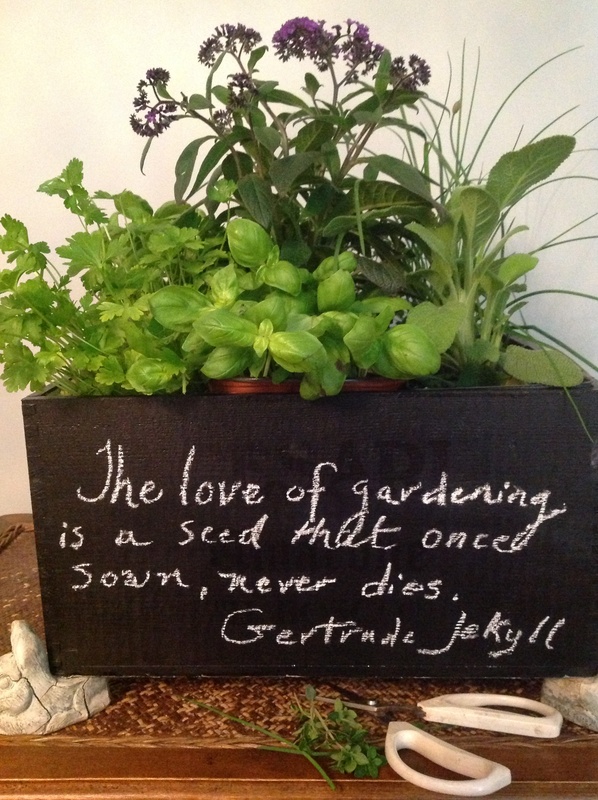 Until then, fresh herbs can make your everyday cooking sing with the promise of spring. With such a lush herb garden at your fingertips, a little snip of this, a little snip of that and you will soon be feeling like a cooking goddess/god! Bon appétit! 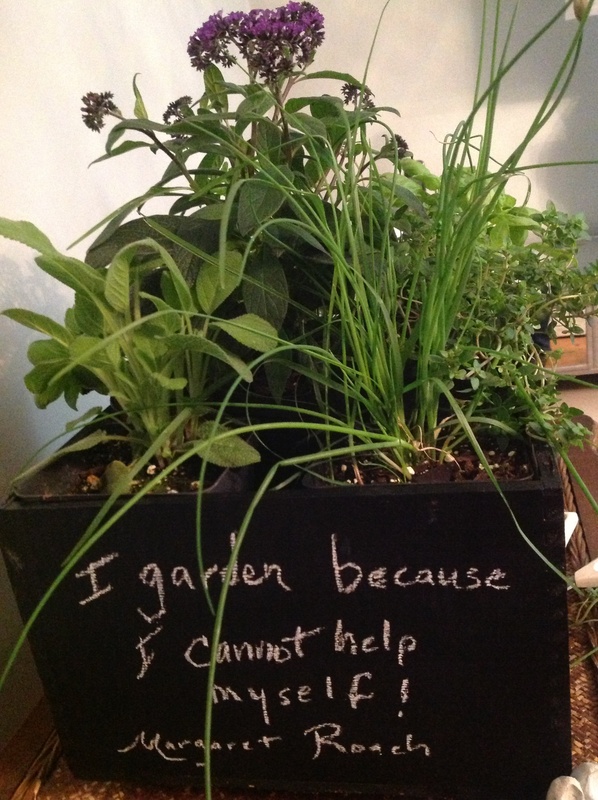 This entry was posted in Crafts, Gardening, Recipes and tagged basil, chalkboard paint, chalkboard paint herb garden, chalkboard paint project, chives, cooking with herbs, growing herbs indoor, heliotrope, herb growing, Indoor gardening, Kitchen garden, parsley, sage, thyme, upcycling wooden wine crate by Johanne Lamarche. Bookmark the permalink. Johanne, your talents know no bounds. How clever and so YOU! Thank you Dona! I am particularly proud of this project as I came up with the idea and love how it turned out! Bonne idee et j aime beaucoup le look … Je Vais definitivement essayer ton idee wow ! tu as tellement un talent et nous sommes tellement chanceuses que tu parades tes idees! Merci Nicole. Facile et très français comme style. J’ai adoré ce projet et je n’en ai jamais vu de pareils. Je n’ai pas beaucoupd de lecteurs au Canada et je ne comprends pas pourquoi. Encourage tes amies de me suivre, stp. Merci! You can get all the wine crates you want! I was so excited to come up with this totally original project. It is so stinking cute! Johanne, Another fabulous idea! I am crazy about this one most of all as you can change out the writing…mercy! I was so excited by this post too Teresa. I have never seen anything like this out there and felt a surge of inspiration while creating it. My husband was ready to have me go into business making them! I reused it a few weeks later with an international luncheon I hosted(azalea post) and wrote welcome in all the native languages spoken by my guests. A few days later I used it again for my son’s graduation party with his high school and college names and congratulations messages. Very versatile concept. Feel free to copy it! Thanks for reading and taking the time to comment. I really appreciate it. Seems like I am a little late to the party but wow this is so creative! I am definitely going to put this to use once my indoor herb garden starts growing. Thanks for the tip! I’m so glad you found it Sam! It was my personal favorite last year and I was happy it came in my readers’ top choices too so I could feature it again. I used the crate again two more times for a luncheon where I filled it up with azaleas and wrote welcome in many languages of the guests attending(also on the blog) then again for a grad party where I wrote all kinds of messages for the guest of honor(not on blog). Thanks for dropping by and Happy New Year!